TFO | Shes a ManiYak! Did I Hook the Trout or Did the Trout Hook Me? 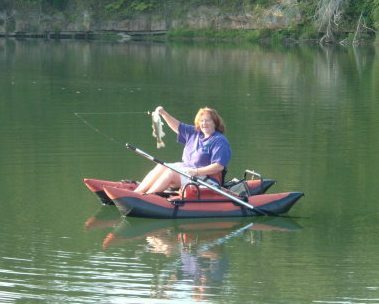 After having bought a kayak last summer to replace my trusty old Trout Unlimited Madison I met up with the folks from Yakangler.com. 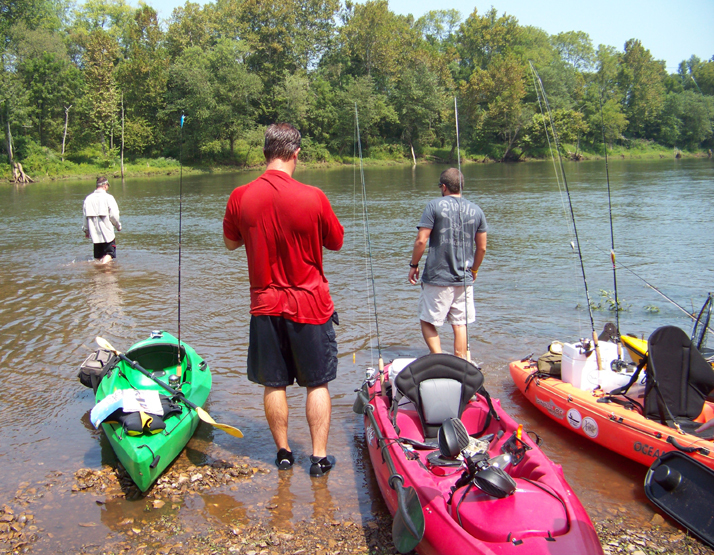 The first trip they had planned was for the coming weekend on the Cumberland River, premium trout water! I dusted off the old fly rod that had stood in the corner and headed to the internet. I needed to know how to cast this thing and had little time to learn. As I was pouring over some websites it struck me that my rod looked kind of old so I decided to Google the model number on the reel. It turned out I had a Shakespeare automatic reel manufactured sometime around 1963. 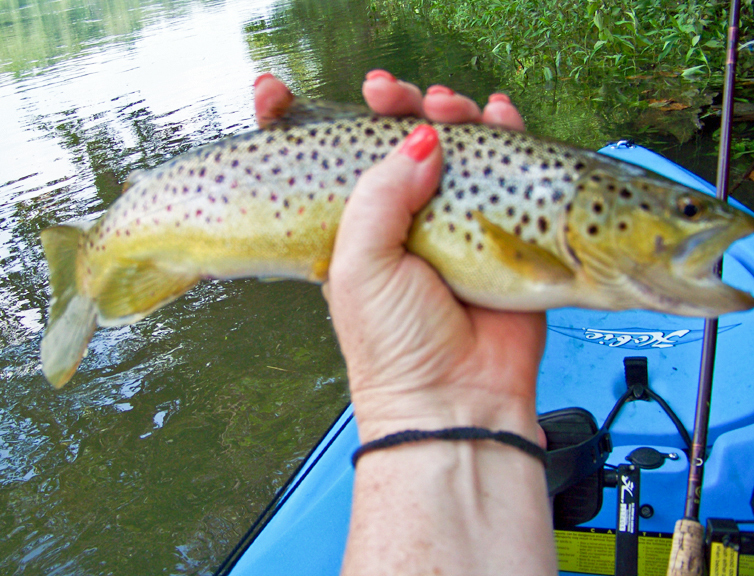 Although we’re not talking about a purist’s brand of choice, it was still close enough to being an antique that I wasn’t ready to risk it on unknown waters and fishing from my kayak for the first time! I still wasn’t sure I would be able to use a fly rod without getting instruction from someone so I didn’t want to spend a lot of money. For the upcoming trip I went to a local sporting goods store, talked extensively with the fishing department manager (who was an avid fly fisherman) about entry-level combos. He recommended a four-piece 5 wt., 9′, Scientific Angler as an inexpensive way for me to try my hand at skating a few flies. Saturday morning finally arrives. After some shuttling around of vehicles we all drop our yaks in the water. It definitely wasn’t idea conditions that September morning. The river was high, the current was way too fast, and the water was close to the color of chocolate milk. I let everyone drift away from me a bit, I didn’t want to hook any of my new acquaintances in the forehead since I didn’t know what I was doing. It turned out I could actually feel what I needed to do to shoot that fly out further with each cast and wasn’t doing too bad for a beginner if I may say so myself. About twenty minutes into the trip I had a brown jump up out of the water and come back down to take that fly! Now I know to those experienced in fly fishing this isn’t anything new, but it was my first time to see it. I will never forget the sheer excitement I felt and needless to say, I’ve been hooked on fly fishing since that day. I’m hard pressed to pick up a spinning rod now. Since that trip I’ve gone on several fishing and camping expeditions with my new-found friends at Yakangler. I’ve also upgraded to a TFO 9′ 5wt, and have also purchased a Redington 8wt. I’m so obsessed with the experience that I’m now asking myself, did I hook that trout or did it hook me? After doing some research I’ve learned that I have a couple of nice trout rivers in my area and believe there are more. 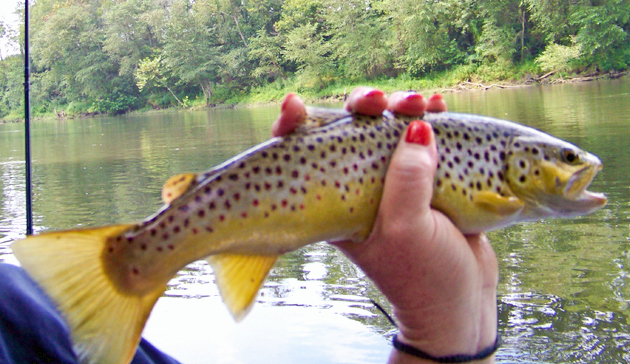 The Kentucky Department of Fish and Wildlife is working hard at finding additional places that can sustain trout populations. In the meantime they stock several creeks and rivers for “put and take” but so far I haven’t fished any of them. I’m very thankful to have the chance to fish for trout fairly close to home, but if KDFW hadn’t of worked to develop those fisheries years ago such opportunities wouldn’t exist. That’s why the ongoing efforts of Trout Unlimited and other organizations to revive debilitated rivers and streams, protect waters like Bristol Bay in Alaska, or stop mountain top removal in Kentucky is essential in preserving our cold-water fishing so future generations can enjoy the same blessings we have.